English translation by Mitsuya Sakaemura and Preston Nevins. Sasabe Commemorating David Brin's visit to Japan as Guest of Honor of the 65th World Science Fiction Convention "Nippon2007," as a cooperative plan :) we at Anima Solaris have decided to put together a book review. Tom Whitmore wrote an introducion to Brin in Nippon2007 Progress Report #2. In it, Tom recommends reading Startide Rising as an introduction to Mr. Brin's body of work, but which do you like the best? 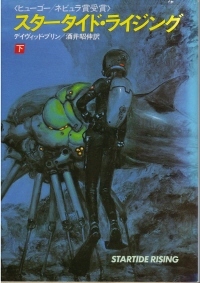 ttani Personally I like Heart Of The Comet (1986) that he wrote in collaboration with Gregory Benford. Sasabe Ah, there's some hard SF that showed off the good points of both Brin and Benford. I like that too, but let's try to choose from stand-alone works shall we? :) First of all, Brin's debut work, Sundiver. There might be a simpler reason. 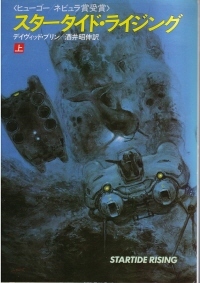 The publishing order was: Sundiver (1980), Sundiver (Hayakawa Bunko SF, 1986), Startide Rising (1983), Startide Rising (Hayakawa Bunko SF, 1985). 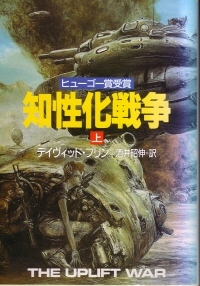 The Japanese publishers didn't trust that the first full-length novel from a (then) rookie like Brin would sell in Japanese translation. But then when Startide Rising won both the Hugo and Nebula they translated it and sure enough it sold! So the next year they went back and released Sundiver. While they were at it they figured The Practice Effect would sell as well, so translated it too. It was probably just a business decision. Sasabe When I asked the translator, Mr. Akinobu Sakai, he said, "It was because Startide Rising took the Hugo and Nebula that Brin was finally recognized as a novelist. 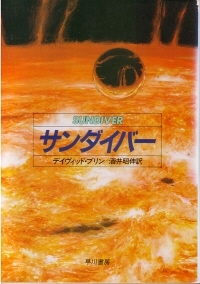 When it won they rushed to release Stardust Rising, and since it was the same series, they did Sundiver too. That sort of flow." The saying goes that "The Golden Age of SF is age 12 (or maybe 15)." That's when the flexible minds of young readers tend to consider everything they read a masterpiece (I was the same way). Oftentimes SF is written from a young point of view, and while that may be expected from a youth-oriented genre, you're always going to find people who love stories of nameless young people succeeding through their wits and effort. Ripley It seems that there aren't many children 12 to 15 that actually read books these days. (ToT) You could probably divide them into kids who read anything they can get their hands on, those who read nothing but manga and light novels,* and those who don't read anything at all (the ones who read manga pretty much all read light novels). We can only pray that some of those kids graduate from light novels up to actual SF. Sasabe The emotion-glyph called syullf-tha is described as rotating, so Brin probably thought about that sort of stuff. ttani The major premise of this series seems the opposite of Asimov's, in that aliens have reigned over space with great power and wisdom much earlier than humanity, so it's interesting that Brin is working on the continuation of Asomov's Foundation series. One of the distinguishing features of this Uplift series is Humanity's undaunted spirit - we never submit to the powerful Galactics - and this could be considered an overall optimism. As shown in Poul Anderson's famous early short story "The Helping Hand," I think it's pretty standard in American SF to find a spirit that isn't comfortable being absorbed into a large power, and sets a high value on diversity. Heinlein's Lazarus Long refused to be absorbed into the Group Ego and live an idle life, and Mike Resnick's Kirinyaga (linked above) also celebrates self-reliance and diversity. Basically this boils down to valuing uniqueness, and for SF fans who like unusual things, that's an easy thing to accept. That's why reading stories by women SF writers has such an impact, for example choosing but a refined clone state over barbaric pirates, or a woman who chooses an ET over a disagreeable man. I guess such novels are perfectly suited for that kind of SF fan with old-fashioned tastes. I'm an SF fan that loves hard SF. I really enjoy Brin's works, but I'm also connected with the <Komaken> group focusing on the works of Nippon2007 Japanese guest of honor Komatsu Sakyou. I'm an SF fan just starting to comprehend that even if I spend my entire life in the process, I'll never be able to read all of the high-quality SF that's been released, and all that's still to be released. Former manga artist (mainly SF). Now I'm a special part-time teacher and volunteer, teaching elementary and junior-high school students art and manga. MOZ Nakano. Overseas sales-promotion tool director. My job description in the office is "Chief Planner" for what it's worth. 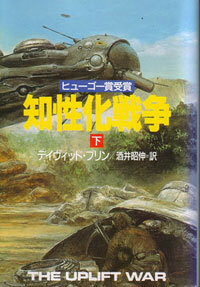 The encounter with SF is the TV programs which I saw in early the 60s. "The Outer Limits" remains to my impression strongly. The works seen at my childhood, I think episodes had big influence on my SF view. My present favorite writers are Clarke, Lem, Sakyo Komatsu, and Le Guin.